ISIS defeated in Syria; Mueller probe ends; Green Beret, EOD tech KIA in Afghanistan; massacre in Mali; Russians in Venezuela; US vets in DC; And a bit more. ISIS is no longer holds any territory in Syria, the U.S.-backed Syrian Democratic Forces announced on Saturday. “Once estimated to span territory up to about the size of Maine, the group’s self-declared caliphate in Iraq and Syria has disappeared entirely in less than five years,” The Atlantic’s Kathy Gilsinan wrote this weekend in review. “At least 7,500 civilians died in US-led Coalition actions” since August 2014. Here’s 44 seconds of captioned b-roll from Baghouz today, via Agence France-Presse. What you’ll see there: a devastated wasteland of smoldering fires, burnt-out cars and trucks, canvas tents flapping in the wind, discarded suicide vests, mangled motorcycles and more. The guerrilla war continues in Iraq as ISIS fighters clashed with with Iraqi security forces in Nineveh province’s Sinjar district on Sunday, Kurdistan24 news reported in the evening. A half-dozen ISIS fighters attacked “Sunni components of the Hashd al-Shaabi militias,” and three of the ISIS fighters blew themselves up, but only managed to injure one militia member. Read on, here. What’s more, Kenner argues, while taxes are out as a form of revenue, the group can still raise funds through extortion and corruption, including the $30 billion pledged by foreign countries to help rebuild the lands ISIS helped destroy. Read on at Defense One, here. For your ears only: How should we archive (or not) terrorist propaganda of the sort ISIS and its supporters created? WNYC’s On the Media tackled the topic this weekend in their latest podcast. Find this terrorist propaganda segment, which clocks in at just under 16 minutes, here. Said one Russian politician: “The results of Mueller’s investigation are a disgrace for the U.S. and its political elites.” That was from Alexei Pushkov, chairman of the information committee at the Federation Council. More Russian reax from AP, here. What now? AP has a separate report on what Democrats’ plan appears to be for the days ahead, here. Pentagon: We’re Buying Boeing F-15s to Keep 2 Fighter Makers in Business // Marcus Weisgerber: The acting defense secretary’s ties to the company had nothing to do with the decision, a senior defense official said Friday. Acting SecDef Under Investigation for Boeing Ties: Pentagon Watchdog // Charles S. Clark, Government Executive: DOD’s inspector general is looking into allegations of a conflict of interest that surfaced at a Senate hearing. What Mueller’s Trump-Russia Report Leaves to Do // Natasha Bertrand: Now it’s largely up to Congress to solve the remaining mysteries of the Russia investigation. We Need a NATO/EU for Cyber Defense // Chris C. Demchak, Naval War College cybersecurity professor: The world’s democracies aren’t properly organized to fend off today’s authoritarian attacks, let alone reshape the internet and key industries to stop tomorrow’s. To Protect Africa’s Oceans, Stand Up to China // Yasin Hagi Mohamoud: China is certainly not the only country with predatory fishing fleets, but its boats are the ones that have been invited into our territorial waters by a foreign power. Inside the Energy Dept.’s New $96M Infrastructure-Security Office // Brandi Vincent, Nextgov: The new Office of Cybersecurity, Energy Security, and Emergency Response aims to deflect cyber, manmade and natural security hazards. Welcome to this Monday edition of The D Brief by Ben Watson. Thanks for reading! And if you’re not subscribed, you can do that here. On this day in 1994, U.S. troops exited drought-ravaged Somalia 15 months after their first arrival, and almost seven months after the disastrous battle in Mogadishu remembered in the 2002 action film, “Black Hawk Down.” Osama bin Laden is believed to have paid close attention to this U.S. exit from Somalia, according to this recollection from journalist Mark Bowden, speaking to NPR in 2013. Al-Shabaab gunmen killed Somalia’s deputy labor minister during a complex attack on a government building in the capital of Mogadishu on Saturday, the Associated Press reported this weekend. Four other civilians were killed and 10 others were wounded during an hours-long battle involving at least five Shabaab attackers. The deceased include Saqar Ibrahim Abdalla, Somalia’s deputy minister of labor and social affairs. Also in Africa: 134 people were killed on Saturday in Mali when “Armed men reportedly dressed as traditional hunters” attacked a village in Ogossagou in the Mopti region, central Mali, CNN reported Sunday. The murders were carried out with guns and machetes, and the victims included women and children. The party responsible: an ethnic militia of the local Dogon community. AFP reports that militia had Mali state backing until Saturday’s massacre, which “targeted members of the Fulani ethnic community who are accused of having ties to jihadists,” the BBC added. More here. “Spc. Joseph P. Collette, 29, of Lancaster, Ohio. Collette was assigned to the 242nd Ordnance Battalion, 71st Explosive Ordnance Disposal Group, Fort Carson, Colorado.” A bit more on Collette, here. “Sgt. 1st Class Will D. Lindsay, 33, of Cortez, Colorado. Lindsay was assigned to 2nd Battalion, 10th Special Forces Group (Airborne), Fort Carson, Colorado.” A bit more about Green Beret Lindsay — who leaves behind a wife and four children — at Military Times, here. The UN says a U.S. airstrike in Afghanistan has killed 13 people, “mostly children,” Agence-France Presse reports this morning in a developing story. Reuters reports the strike killed 10 children and three adults during a 30-hour battle in Kunduz province. “Sgt. Debra Richardson, spokeswoman for the NATO-led Resolute Support mission in Afghanistan, confirmed on Sunday that U.S. forces carried out the air strike. She said the mission aims to prevent civilian casualties, while the Taliban intentionally hides among civilians.” A bit more from Reuters, here. Happening today: The U.S. is going to fire not one, but two warheads in an unprecedented missile defense test, Bloomberg’s Tony Capaccio reported Sunday. 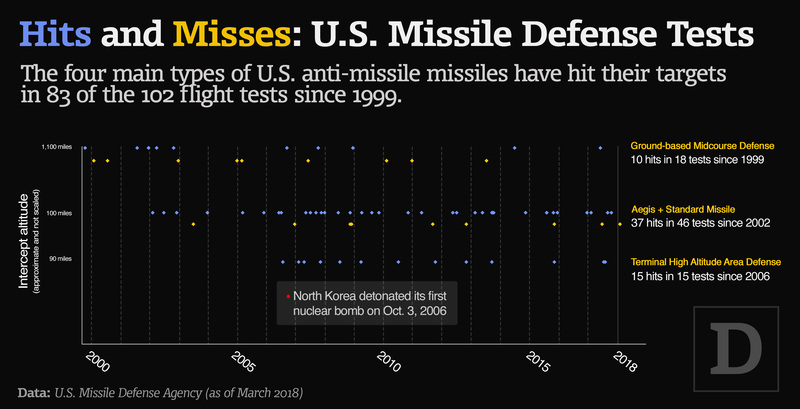 “The test has been delayed by over a decade, as it may be the most challenging test in the program’s near-30-year history,” according to Cristina Chaplain, space and missile defense systems director for the Government Accountability Office. Read on, here. Extra reading: What’s the success rate for this ground-based midcourse missile defense system scheduled for new testing today? Find out in our multimedia explainer from June, here; or go straight to the chart of hits and misses going back to the year 2000, here. Russia’s new missile is enormously expensive and hasn’t flown farther than 22 miles, despite Vladimir Putin telling the world it has unlimited range, CNBC’s Amanda Macias reported this weekend — extending her May 2018 report on those 22 miles just a tiny bit. ICYMI: Russia reportedly moved nearly 20 air-to-ground hypersonic missiles to an unspecified test site, CNBC’s Macias also reported last week. Those missiles (aka, “Kinzhal”) were tested in July on a target some 500 miles away. It’s also reportedly been “mounted and launched 12 times from a Russian MiG-31 fighter jet… The latest revelations come a little more than a year after Russian President Vladimir Putin unveiled the Kinzhal system alongside five other advanced weapons,” two of which Macias reports will be ready for use by 2020. Read on, here. Russian cargo planes appear to have landed in Venezuela this weekend, and now the country has Russia’s S-300 air defense system up and running. More on the planes, here; more on air defense, here. President Trump may have just poured gas on Russia’s 21st century annexation of territory. That’s because “On Thursday, President Trump tweeted his intention to recognize Israel’s sovereignty over the Golan Heights, territory that Israel annexed from Syria in the wake of the 1967 war,” the Washington Post reported this weekend. Russian state media reacted gleefully to Trump’s Golan Heights tweet, purportedly saying “by making his Golan Heights statement Trump surrendered any right to criticize Russia for the annexation of Crimea,” according to Russia-watcher Julia Davis. And finally today: Veterans surprised a D.C. elementary school this weekend with renovations including new paint jobs, furniture, murals, dry erase boards and more, the Washington Post reported Sunday. On the receiving end: Martin Luther King Jr. Elementary in southeast D.C.
Involved in the renovations: “About 80 female veterans led the efforts in the Congress Heights neighborhood of Washington. Some of them were locals and others traveled to the District to attend the Women Veterans Summit — an annual conference that trains veterans to be leaders and activists in their communities. The Mission Continues, a nonprofit organization that connects veterans with their communities through services, hosted the summit.” Details, quotes and more, here.